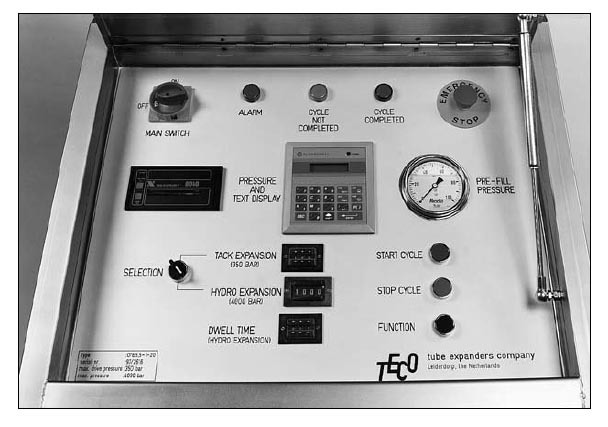 The TECO Hydro Expansion Unit has been developed for speedy simple tube expanding in the construction of heat exchangers, condensers, steam generators, cooling apparatus, etc. Tubes are expanded by precisely controlled hydraulic pressure. The primary pressure is obtained by using oil and the secondary pressure by water. It is the water that creates the pressure for the tube expansion. This equipment can easily expand large wall thickness tubes without occurrence of flaking. Expands in one action tubes with a large wall thickness. Expands tubes over a long length. Eliminates the need for step tube expanding. No work hardening of the tube as this is not a rolling type expansion. Eliminates distortion of the tube sheet, as there is no extension of the tube during expansion. Does not therefore stress welded tube ends. Increased holding strength between tube and tube sheet. Tighter tubes in ring grooved tube sheets. Smooth contour change between expanded and nonexpanded part of the tube. Eliminates the need to clean down after expanding. No rotary reaction of the tube to hold. The TECO Hydro Expansion is the direct application of high internal hydraulic pressure within a tube in order to form a tight joint between the tube and tube sheet. This pressure or expansive force is accurately set, measured, repeated and controlled. The pressure level can be calculated or determined empirically. Pressure from the control unit is intensified to the desired high pressure. 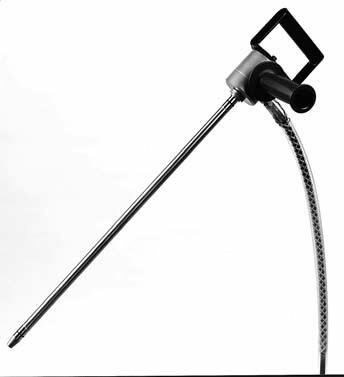 It is transmitted through a 6 metre (20 feet), small bore, flexible high pressure tube to a lightweight hand held gun. 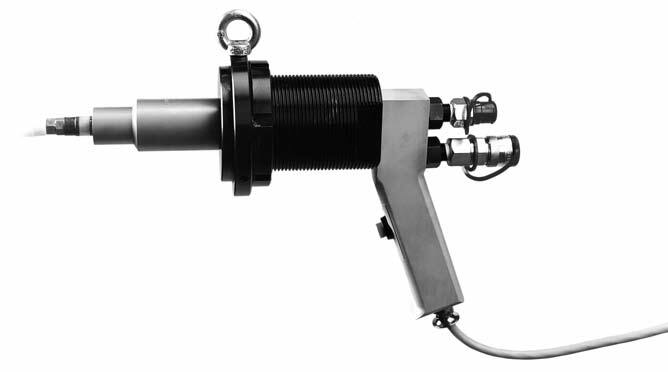 The mandrel, which latches into the gun, directs the pressure to the inside diameter of the tube and is held within an accurately prescribed pressure zone. Pressure is contained within the expanding tube by a special elastic seal. Pressure is applied over the full length of the joint in one step. Stress, crevice corrosion, and metallurgical changes are minimized. Before contact is made with the tube sheet a small reduction in tube wall thickness and length occurs because a constant volume of tube material is expanded to a larger diameter. However, no change occurs during the high pressure expanding, eliminating the shear strain and loss of seal between tube and tube sheet that is a characteristic of roller expanding. 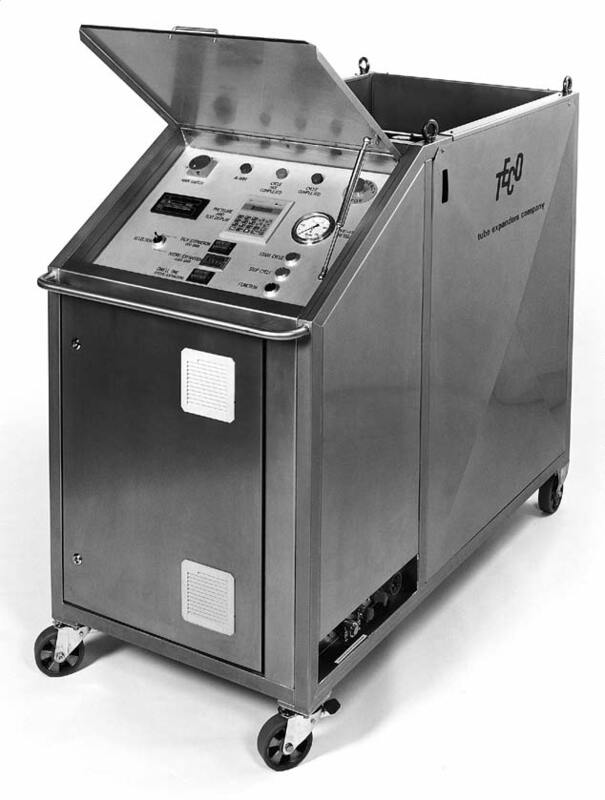 TECO Hydro Expansion cycle is automatic and initiated by the operator pedal on the footswitch. The tube is filled with clean water at a low pressure. It is then intensified to the higher pressure and held for the time required to allow the tube to expand into a stable condition. This dwell time is essential for the stability of exotic materials. Finally the pressure is released and the water drained back into the reservoir. All this takes is just a few seconds so the cycle time is fast. Actual pressure of the water causing expansion is readon a digital indicator and can be printed out if required. Model : TECO Hydro Expansion Unit. Power : 400 volt 3 Phase 50/60 Hz., 16 Amp. Dimensions Control Unit : L 160 cm x W 77 cm x H 137 cm L 63” x W 30” x H 54” Weight : 640 kg (1411 Ibs). Dimensions Hand Gun : L 17 cm x W 21 cm x H 12 cm L7”xW9”xH5” Weight : 4 kg (9 Ibs).